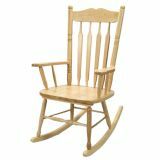 Solid hardwood adult rocker. Four bolts attach the base to the seat frame for easy assembly. 21" wide x 43" high x 24" deep. Easy to assemble. Imported. Additional shipping charges apply. Fully enclosed base keeps children away from durable, stainless steel gliding mechanism. 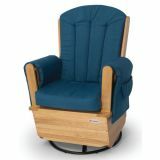 Extra wide seating surface with thick, high density foam cushions provides generous space for caregiver and child. Arm rests are ergonomically designed for the maximum arm support during feeding. High-quality fabric enables seat cover and side panels to be removed for laundering. 3 year warranty. 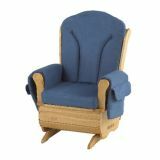 The Glider is constructed of solid wood, has durable material that is easily removed for laundering (arm rests and seat cover only), and has storage pockets to help keep baby's necessities within reach. Comes in Natural color with blue padding. Assembles dimensions are 26"L x 25"W x 40"H. There is a limited one year warranty on wood base and a limited 3 year warranty on steel based glides. 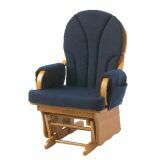 This glider is easy to assemble and includes all of the necessary tools.